In order to study stress, you need a good way to measure it. A common method to measure how “stressed out” an organism is at a particular time is to measure the concentration of “stress hormones” in their blood. In reptiles we measure corticosterone (CORT), which is similar to cortisol in humans and fish. Our lab uses an ELISA (enzyme-linked immunosorbent assay) to determine the concentration of CORT in our samples. These kits are commercially produced for a variety of hormones and make it very convenient to do so, though it takes a solid day of lab work. Jenny, Chris, and I have each been running a number of CORT assays in the last months in order to work through our samples from last summer. One of the lab’s undergrads, Mark H, is also learning this technique to run some of his own samples. Gail teaching Mark how to prep a CORT plate. Although these kits are pretty straightforward, you can’t help but be paranoid about doing it right. A mistake costs you not only the precious samples you are running but also the cost of the kit (which is not insignificant!). Because of this, we make sure any newcomers to the kit are trained up and very comfortable with the assay before we turn them loose. 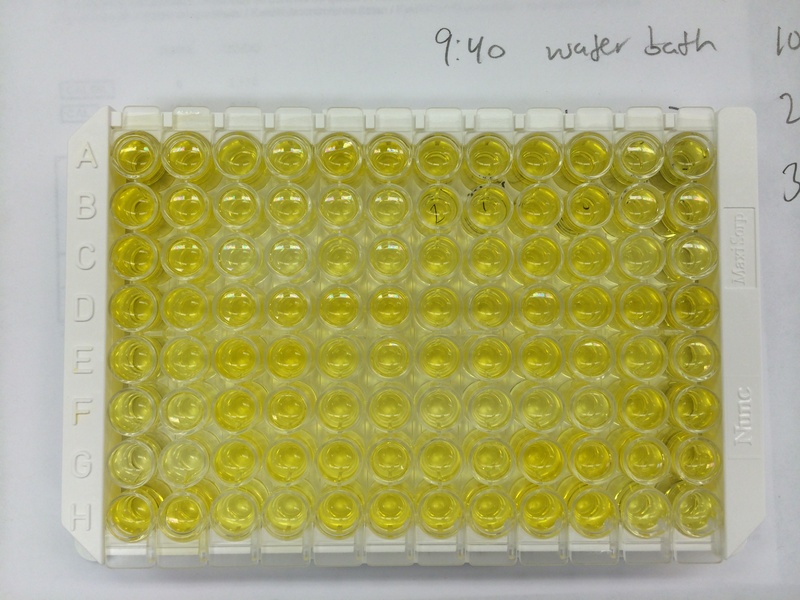 After the day of lab work, the completed plate looks something like this (above). This plate is then placed in a micro-pate reader, which reads the absorbance of each well at various wavelengths. The result is a spreadsheet of numbers, which ultimately lets you determine the concentration of CORT in each of your samples. It’s always a little nerve-wracking at the end of the day when you walk away with just a flash drive, but the data usually turns out just fine! The next step: data analysis! Categories: Research in PA, Undergraduate Research | Tags: cort, Eastern fence lizard, ecology, fence lizards, herps, in the lab, Lizard, Research, snakes, stress | Permalink. Why Did the Fence Lizard Cross the Road? To get away from fire ants of course! Fence lizards, like most organisms, generally prefer to avoid being messily devoured by predators, and, to elude predators, animals employ a variety of defensive strategies. Animals may hide, flee, avoid detection (by camouflage or other means), be poisonous, pretend to be poisonous, have armor, and even preemptively attack a predator. For example, the Eastern Hognose Snake (Heterodon platyrhinos) employs a truly astounding suite of defensive strategies, including: puffing itself up to look bigger and more like a venomous snake (hence their nickname, the “spreading adder”), striking with a closed mouth, vomiting, and defecating to make itself as gross/distasteful as possible, vibrating its tail to mimic a rattlesnake, and playing dead by turning over on its back and sticking out its tongue. 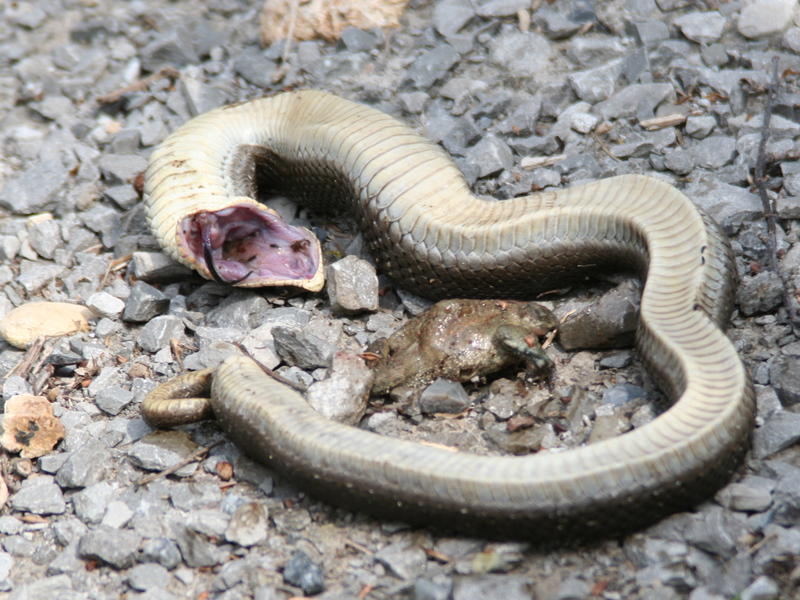 A hognose snake feigns death (thanatosis) as a defensive strategy. Fence lizards have defensive strategies too. Research in our lab has shown that one of the main ways that fence lizards adapt to fire ants is by fleeing from ants more frequently. Fence lizards from areas without fire ants will only flee from fire ant attacks about 50% of the time; the other half of the time, they freeze and remain motionless, and the lizards would likely die if we did not remove the ants and allow them to recover. However, when we study fence lizards from areas with fire ants, we notice that up to 95% of lizards flee when attacked by fire ants, a much higher percentage. This strategy is very effective, since fire ants can only prey on adult fence lizards when they can recruit to attack in large numbers. However, in our lab meetings we began to wonder: why do fence lizards from areas without fire ants freeze so much of the time? It seems most likely that lizards from areas without fire ants freeze when attacked because this is an effective, adapted defensive strategy against native predators. In other words, just as fire ants have put pressure on fence lizard populations to adapt (in this case, by running away more often), native predators have put pressure on fence lizards to freeze (about half the time, at least). While not running away from a predator when given the chance may seem like a bad strategy, this approach makes more sense when we consider what the native predators of fence lizards are. They include many types of predatory birds, such as hawks and falcons, as well as several snake species, including black racers (Coluber constrictor) and coachwhips (Masticophis flagellum) among others. These predators are primarily visual hunters and also very speedy. A fence lizard in danger from one of these predators would have little chance of outrunning it, unless a refuge were near at hand (or claw); however, as fence lizards have excellently camouflaged patterning, freezing could be a very effective strategy, as the bird or snake might, like the erroneous T-rex in Jurassic Park, have a difficult time seeing the fence lizard if it remained motionless. After these discussions, I, along with two undergraduate researchers, Shannen McGinley and Elexa Baron, decided to test whether fence lizards from different areas (those with fire ants and those without), would react differently to a simulated predator attack. To conduct these tests, we first needed a predator; after some quick research, I discovered that a common avian predator of fence lizards is the American Kestrel, a smaller falcon that preys on many species of lizards. The Penn State University Bird Collection happened to have a preserved kestrel salvaged from a car strike that they were kind enough to lend us. After naming our kestrel “Cadfan”, I proceeded to get him ready for his close-up: I braced his wings into a half spread position, as if he were swooping in for a strike; built him a wire harness, to allow us to hang and swing him from the ceiling in a simulated attack; and gave him a pair of really intense eyes (as we know from personal experience that fence lizards will respond to large eyes and being stared at). Cadfan and me chilling in the lab. Note his intense and intimidating gaze. Next, we needed to design an arena in which to conduct behavioral trials. We set up a small arena in the middle of an animal room that contained a tub identical to those our lab lizards live in, and we lined it with sand and put in a half log, a type of lizard shelter. To allow us to simulate a kestrel attack, we hung Cadfan from the ceiling of the animal room using fishing line. We also built a blind for Cadfan and for ourselves, to prevent the lizard from seeing either the kestrel or the humans. As part of the construction, we built a webcam into our blind to allow us to observe and record all the trials for later analysis. Left: Cadfan hanging over the arena showing how close he can swoop to the lizard perch. Right: The backside of our blind, with datasheets, laptop, and webcam set up to allow data collection. After finally getting the room set up to our exacting specifications, we were ready to run trials with our lizards. Conducting a trial required two people. One person stayed behind the blind and held Cadfan up and out of view of the lizard. The other person fetched a random lizard from its housing and walked it quickly to the trial room, where we took it’s body temperature and set it on the log perch in the middle of the arena. That second person, the lizard-getter, then walked behind the blind, starting recording with the webcam, and gave a big thumbs-up signal to the bird-holder. The bird-holder simultaneously released Cadfan, and also turned on a small lightbulb that could be seen in the webcam but not by the lizard (this allowed accurate timing of the trial). We let Cadfan make four swoops over the head of the lizard and then returned the lizard to its housing, while recording if the lizard reacted to the simulated attack and how long it took to react. We also classified how strong any reaction was; some lizards just ducked their heads or shifted to the side, much as you or I might if a large insect flew at our heads. Other lizards reacted much more strongly and dove into the sand or underneath the log shelter. See below for a video showing our setup and a couple of trials! We’re still analyzing the data from these trials now, but, to the naked eye, we haven’t seen a large difference in responses to the bird predator based on where the fence lizards come from as we’ve seen in response to fire ant attacks. This could mean that lizards might be able to distinguish between different types of predation threats or that something else is going on. We’ll post again when we publish a paper on our trials, so keep an eye out for those results here (and any attacking kestrels that might be nearby)! 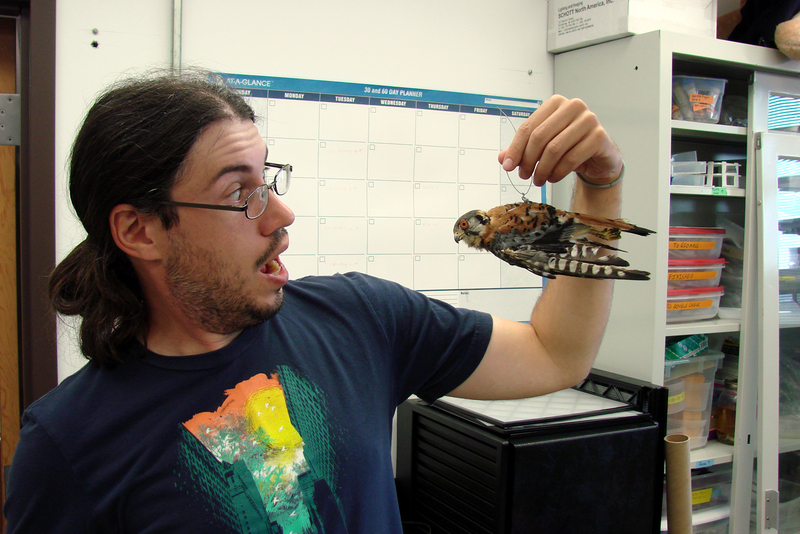 Categories: Research in PA | Tags: ecology, Evolution, falcon, fence lizards, fire ants, in the lab, kestrel, predator, Sceloporus | Permalink.